Nitrogen fertilizers are a double-edged sword for soybean farmers. While they’re vital for large crops, they’re also expensive and potential pollutants. Thankfully, Brazilian researchers found a different way to boost yields by increasing the number of nitrogen-fixing bacteria in the plant’s roots, according to a ScienceDaily report. Nitrogen is essential to the production of protein. Soybeans normally get that nutrient thanks to beneficial bacteria found in the soil that transfer to the root nodules of the plant. These microbes draw nitrogen from the air and turn it into a form that the plant can assimilate. The process is called nitrogen fixation. In exchange for the nitrogen, the plant provides the microbes with sustenance. Sometimes, this natural process does not provide enough nitrogen for the needs of the plants. Soybean farmers supplement this lack with nitrogen fertilizers. The Embrapa Soja research group offer a different way to boost crop yields. Their results show that increasing the number of root nodules of soybean plants encouraged the growth of the resident nitrogen-fixing bacteria population. The larger numbers of microbes lead to increased levels of nitrogen, which in turn improved crop yields. 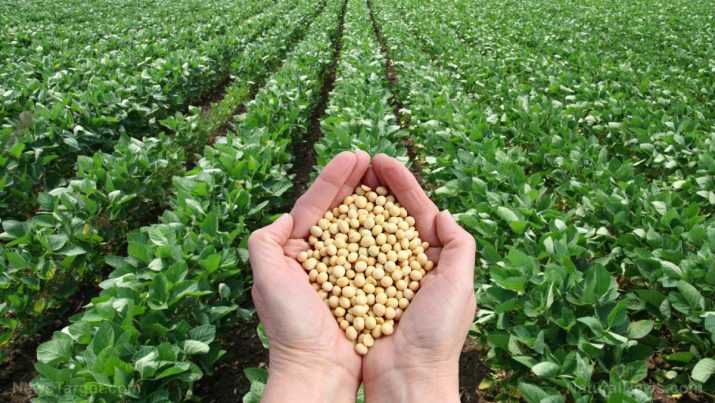 In their experiment, Hungria’s team followed the standard protocol of soybean farmers. They inoculated seeds by spraying nitrogen-fixing bacteria on them before planting. But they didn’t stop with that initial treatment. Researchers sprayed the plants with more bacteria during different stages of their growth. According to their results, soybean plants that got extra inoculations grew more root nodules than counterparts that got just one dose. While the initial inoculation process increased yields by 30 percent over non-inoculated crops, spraying growing plants with additional doses led to even bigger gains. The researchers did not expect the extra inoculations to work so well. Earlier research led them to believe that every nodule present increased the difficulty in forming a new one. However, their results showed that the plants didn’t have problems in growing new nodules for their burgeoning bacterial population. “To discover that nodules aren’t regulated as strictly as previously thought is an important finding. The limitation happens particularly at the beginning of soybean growth when the first nodules appear,” Hungria remarked. Biological nitrogen fixation possess several sustainable advantages over fertilizers. The first one is a much smaller carbon footprint. Fertilizer manufacture is usually powered by fossil fuels. Hungria estimated that producing one pound of nitrogen results in at least 10 pounds of carbon dioxide. The next advantage is a reduction in nitrogen runoff. Unused fertilizers can find their way into local bodies of water. Once there, they can trigger massive algal blooms that consume all oxygen in those waters, killing off anything that lives there. Finally, biological fixation incurs smaller costs, making them much more viable in poorer regions. Nitrogen fertilizers are expensive and must often be imported; Brazil, for instance, gets 70 percent of its fertilizers from foreign sources. The strategy of multiple bacterial inoculations is already being practiced by a number of Brazilian farms. Hungria reports that the initial results match the expected yields. While she believes these results can be replicated in other countries, Hungria is aware that the soybeans grown in every country comes from a unique genetic background. To this end, Embrapa Soja has struck up a partnership with Kansas State University to test the viability of biological nitrogen fixation in the U.S.
Visit Harvest.news for more articles on agricultural innovation.